The CIA (Complex Interface Adapter) is an interface chip used in the Commodore homecomputer. It controls most of the I/O processes and contains as well the internal timer (clock). The CIA was developed from the Semiconductor manufacturer MOS Technology, which was taken over in 1976 by Commodore. 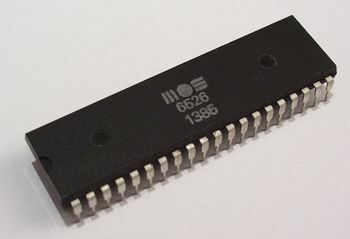 Inside the C64 there are two CIA 6526 chips used; later C64-versions may also use the 6526A or the 8521. The lines are lead through open collector with internal pullups. In the C64 some of these lines are used to monitor/control the I/O devices (keyboard, joystick, iec, etc. ), some are connected with the VIC to define which area of memory it can address, others are for free disposition and are available at the userport. 8- or 16-Bit data transport (reading or writing) with handshaking. the latch can be set directly, the timer can only be read indirectly via the latch. 8-bit shift register for serial In- and Output. Read: Joystick Port 2: Bit 0..3 Direction (Left/Right/Up/Down), Bit 4 Fire button. 0 = activated. Read: Joystick Port 1: Bit 0..3 Direction (Left/Right/Up/Down), Bit 4 Fire button. 0 = activated. Writing into this register stops TOD, until register 8 (TOD 10THS) will be read. shift register The byte within this register will be shifted bitwise to or from the SP-pin with every positive slope at the CNT-pin. and status CIA1 is connected to the IRQ-Line. Bit 7: 1 = IRQ An interrupt occured, so at least one bit of INT MASK and INT DATA is set in both registers. Flags will be cleared after reading the register! Bit 3: 1 = Interrupt release if a complete byte has been received/sent. Bit 4: 1 = Interrupt release if a positive slope occurs at the FLAG-Pin. Bit 7: Source bit. 0 = set bits 0..4 are clearing the according mask bit. 1 = set bits 0..4 are setting the according mask bit. If all bits 0..4 are cleared, there will be no change to the mask. Bit 1: 1 = Indicates a timer underflow at port B in bit 6. Bit 3: 0 = Timer-restart after underflow (latch will be reloaded), 1 = Timer stops after underflow. Bit 4: 1 = Load latch into the timer once. Bit 1: 1 = Indicates a timer underflow at port B in bit 7. Bit 7: 0 = Writing into the TOD register sets the clock time, 1 = Writing into the TOD register sets the alarm time. The second CIA-chip is identical to the first. 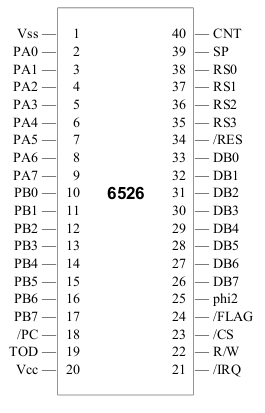 Therefore in the following table are only entries which are specific to the usage in the C64. and status CIA2 is connected to the NMI-Line. Bit 7: 1 = NMI An interrupt occured, so at least one bit of INT MASK and INT DATA is set in both registers. /PC Port Control - Handshake output, Low pulse after read/write on port B.
TOD Time Of Day clock input, either 50Hz or 60Hz input. /CS Chip Select - low level means active CIA. /FLAG Negative edge IRQ input, can be used as handshake for either parallel port. /phi2 Processor Φ2 clock, data transfers occur only on high signal level. /RES Reset input, low signal initiates CIA. RS0 - RS3 Register Select - Used to interface internal registers with bidirectional ports. SP Serial Port - bidirectional, internal shift register converts CPU parallel data into serial data and vice-versa. CNT Count - Internal timers can count pulses to this input. Can be used for frequency dependent operations. Startup screen normal, but no cursor. No keyboard or control port access but cartridge works. Partial failure: some keys or joystick positions don't work, one character appears ahead of startup cursor or random characters appear at startup. Blank screen if chip is shorted (remove to check) and chip may get hot to the touch. No serial or user port access. "File not found" error when drive accessed. Characters may show as blocks on startup screen. This page was last modified on 18 December 2016, at 07:52.